On the 18th of December 2003, I was birding in east Cork with Iain Hill. Having gone to see the female Ring-necked Duck Aythya collaris found at Ballyhonock Lake a few days previously, we checked a few coastal sites, and I suggested that we pay a quick visit to Knockadoon Head, as there had been a number of interesting passerines in Britain earlier in the week. At this point, I tried to take stock of my thoughts; I had been predicting Hume's Warbler to all and sundry for some time, especially given the number of birds found in northwest Europe earlier that autumn. Nevertheless, this would have been a first for Ireland, and could not be identified in such a cavalier fashion, despite first impressions strongly indicating Hume's. As we had both seen the bird, I decided to ask Iain to drive back to the crossroads and put the news out to a few local observers, so that they could get down before dark (there was, and still is, no mobile phone signal in that area). While he was gone, I managed to see the bird again, this time at closer range. 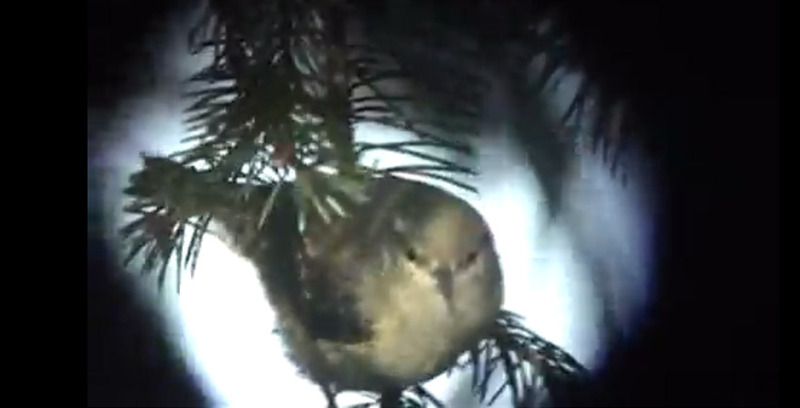 The features which I had previously noted were quickly confirmed, and I also noted the dark legs, insignificant median covert bar and a buffish wash to the supercilium in front of the eye. Just for good measure, the bird called once before disappearing: it was a Hume's! Just before the first birders could arrive, the bird was seen to fly back into the garden, and there followed a few nervous minutes until we decided to check whether anybody was at home (no-one was there). While near the house, we relocated the bird, which then flew back out into the lane below, where it gave good views until dark, calling persistently as it went to roost. Over the next few days, many birders made the journey to Knockadoon, and, while the bird could be elusive at times, everybody managed to get reasonable views. Size and structure: Smaller than a Common Chiffchaff and perhaps more compact (no direct comparison). 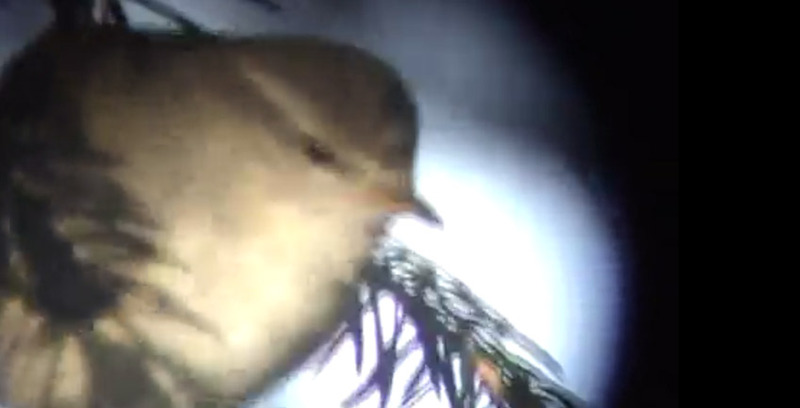 Head: Marked supercilium, much more prominent than that shown by Chiffchaff or Willow Warbler Phylloscopus trochilus. Supercilium buff-toned, especially in front of the eye, and looked less distinct than that shown by fresh autumn Yellow-browed Warbler. 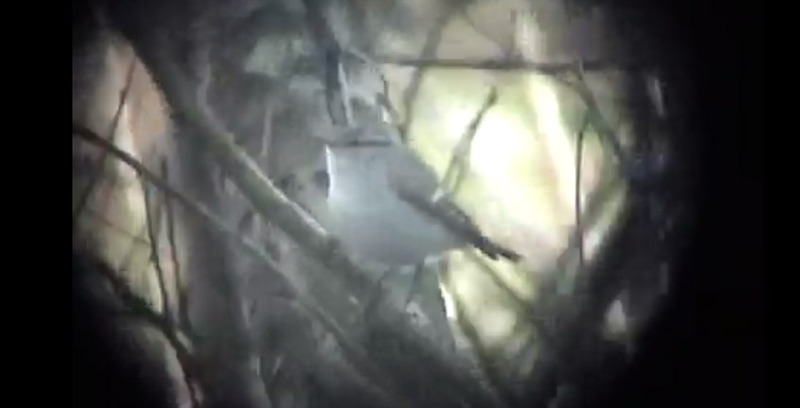 In some lights, the whole supercilium appeared quite buff, and not that obvious as a result, but this also looked whitish at times, when the facial pattern vaguely suggested that of Greenish Warbler Phylloscopus trochiloides. 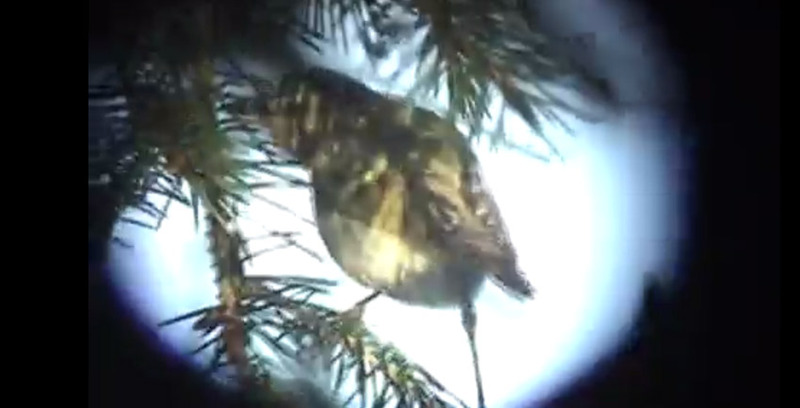 Ear coverts not as mottled as on fresh Yellow-browed Warbler. 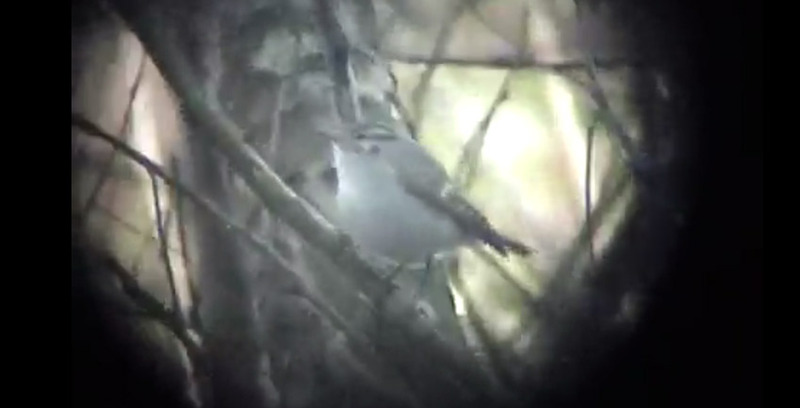 Crown darker than mantle with a faint hint of a median crown stripe (as often seen on Yellow-browed Warbler also). Upperparts: Grey-green upperparts. At times, the bird did look greener than usual, perhaps when picking up reflected light from foliage as it foraged, but it mostly appeared a dull grey-green above, usually with slightly more marked green tones than a typical Siberian Chiffchaff P.c tristis. Rump perhaps slightly greener than mantle and scapulars. Wings: Two wingbars formed by pale tips to the median and greater coverts. The greater covert bar, which was slightly buff-toned, was very obvious at all ranges, but the median covert bar was much more indistinct; at any sort of range whatsoever, only the greater covert bar was visible. Noticably bright green fringes to the secondaries, standing out as the greenest area of the bird, and almost forming as obvious a panel in some lights as seen on the Bonelli's Warblers Phylloscopus bonelli/orientalis. The greater coverts had paler centres than seen in fresh Yellow-browed Warbler, and there was no dark bar at the base of the secondaries. Tertials pale-fringed. Underparts: Duller than on fresh Yellow-browed Warbler, looking to have marked buff tones at times, though a dull buff as on the fore supercilum. In other lights, the underparts looked off-white, vaguely greyish. These are usually cleaner and brighter white on Yellow-browed. Bare parts: Legs dark, appearing blackish at times, but certainly darker than the orangey colour often seen on Yellow-browed Warbler. In stronger sunlight later in its stay, the legs seemed paler, almost orange-brown, but were still a lot darker than on most Yellow-broweds. The bill appeared predominantly dark, with some limited pale on the base of the lower mandible. Vocalisations: The bird could often be picked up by its calls, the most commonly given was an emphatic chew-it (this call has been likened to that of Greenish Warbler in the literature, and was the same call as on the first cut of Hume's Warbler on the excellent 'Calls of Eastern Vagrants' CD), with a Chiffchaff-like hwit also heard. At no time did it utter anything resembling the familiar high-pitched slee-o-eet of Yellow-browed Warbler. 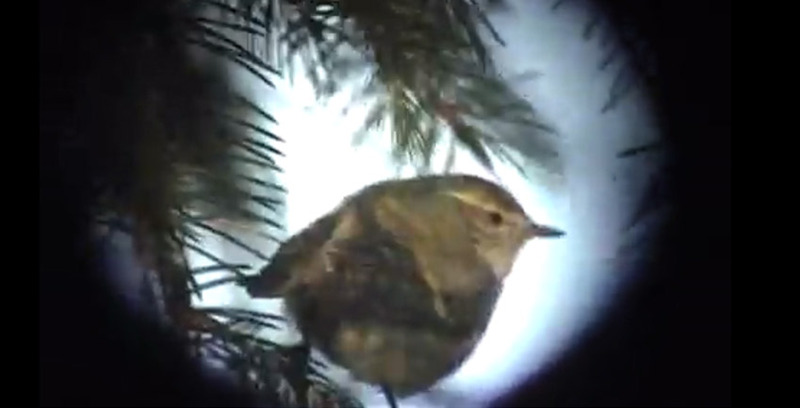 A selection of screen grabs from a video taken by Paul Moore on 20th December 2003. The full video can be viewed on YouTube. Click on the thumbnail for larger images. This bird remained to 6th January 2004 (Irish Birds 7(4): 567). Amazingly, Ireland’s second record closely followed when Killian Mullarney found one at Hook Head, Wexford on 28th December 2003, which remained to 29th February 2004 (Irish Birds 7(4): 567). There have been no further ecords as of 31st December 2015. Hume's Warbler was traditionally considered a race of Yellow-browed Warbler, but it has long been noted that the calls and song differ significantly, and that there are a number of consistent plumage differences. 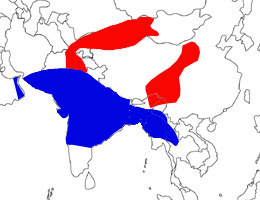 The species was split by the CDNA in 1988, and the BOU followed suit in 1997. In recent years, it has proven to be a regular, though scarce, vagrant to northwest Europe, mainly in late autumn, with several records referring to birds which have over-wintered.